Claudia Baxter has a problem. She’s about to be married off to an aging dandy, and she has to find a way to get out of it. Her parents are determined to see her settled, so drastic action is called for. Her twin brother’s dear friend (and her childhood companion) Henry De Vere has come to visit. When they were children, Claudia always took part in their games and escapades, in fact, she was the instigator of many of them. So now, she concocts a plan. She will sneak into Henry’s bed, and make it appear that she is ruined, so her elderly suitor will reject her. What Claudia doesn’t know is that Henry has suffered from sleepwalking for most of his life, which has put him in a lot of precarious, embarrassing, and dangerous situations. Only recently has Henry begun to believe that the problem is going away. Now Henry wakes to find Claudia in his bed, the whole household is awoken and crowds into his room, believing the worst. The “props” that Claudia used make it appear that not only was she ruined, but tortured in the process. Henry believes the worst, that he ravaged Claudia while he was sleepwalking and is filled with guilt and self loathing. Henry is such a dear man, my heart broke to see him suffering. He was so filled with remorse and anxious to put everything right. Making it worse is the fact that Henry has been attracted to Claudia, but never acted on it because of his sleeping disorder. He felt that he was not safe to be around, so he planned never to marry. He now offers to marry Claudia right away, but he has become a villain, and is banished from the Baxter household. I had a harder time with Claudia and her scheme. She went ahead with her plan without letting Henry know, and then, even when they had a chance to talk together before Henry had to leave, she didn’t tell him the truth. I found her a little weak for just not turning down the marriage her parents were trying to arrange in the first place. Once Henry accidentally stumbled into what really happened, he concocted a scheme to get back at Claudia. While I’m not a fan of paybacks, unless it’s at the villain’s expense, I did feel that Henry deserved to get some of his own back. It was this painful incident that finally made Claudia realize just what she had done, and the consequences for Henry. Despite these reservations, the book did make for a unique and entertaining read. 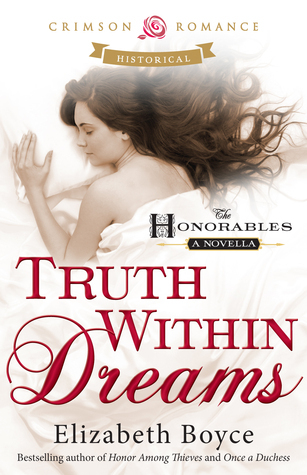 If you enjoy a historical romp, or a little madcap short story, Truth Within Dreams will fit the bill.